Chillout Manga is a great way to describe this DVD. It's engaging enough so you can watch it and not fall asleep, but not stimulating enough so that you have to think. It's visually soothing, but doesn't jump out at you. The background of the animation is very good, but the characters themselves are only basic which appears to be a deliberate attempt to create an elevator-music-for-the-eyes style of Manga. 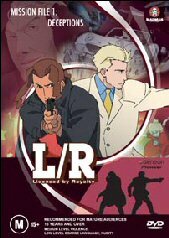 L/R: Licensed by Royalty is based around two agents Jack Hofner and Rowe Rickenback. Rowe is blond, dashing and always in a white suit, whereas Jack is dressed down and the more earthy of the two. The pair are called L/R and they work for an outfit called Cloud7. Cloud7 in turn takes secret contracts from the "Royal family". Where exactly LR is set is a mystery, as is the identity of the Royal family, but from the English accents and the style of buildings and cars and it is definitely meant to be Europe. Cloud7 is composed a central male boss, a secondary female liaison, an eccentric inventor and a female who is the flirting interest of Jack. This Bondesque crew faces different situations in each of the four episodes of this disc. L/R are always the centre of the story with the supporting cast doing not much more than setting the scene, or attempting to be comic relief. The four episodes are called; Be Traced, A Taste of Secret, A Girl goes to City, and Sweet Enemies. Watching each of these episodes is like watching a mini TV sitcom with a bizarre little intermission in each episode. Each episode is self contained, but there are some miniscule references in each preceding episode as to what may come. Each episode starts off with the mission preface, the boys then jump to their task looking dapper and never losing their cool. They are always asked which one is L and which one is R, the mission is resolved and the audience feels good that all is right in the world again. There is no gore, bloodshed, and very little martial action and absolutely nothing but cheer throughout these episodes. Sanitized, but effective. The soundtrack is really the worst part of this DVD. A bizarre blend of easy listening country and bizarre rock is played far too often, and too loud. Its almost seems like the musical director is trying to evoke an emotion from the scenes, but the poor choice of music simply detracts from what's happening on the screen. The plots themselves are simple with just enough going on to keep you from falling into REM. "Be Traced" is about the investigative setup for an art professor selling off museum pieces. "A taste of secret" deals with a double agent and disinformation for an evil organization dubbed "hornet". "A Girl goes to City" is about L/R baby sitting a 15 year princess reject on her journey home, and finally "Sweet Enemies" is about three pairs of agents pitted against each other to win an exclusive contract with the Royal Family. All in all not a bad offering, nothing I would rush out and buy. However if there's not much in the video store or you want a cartoon to recommend to kids knowing that its safe then this DVD is for you. Anamorphic Widescreen. The picture quality was very good, the animation itself looks a little washed out, but this is a product of deliberate color and animation style rather than cheapness of budget. So don't adjust your screens, this is the way it's meant to be. These episodes are available in Japanese and English Dolby 2.0, with the option of English subtitles. The sounds in this film are clear, but the music drowns out most of the background effects, but this film isn't about clarity of sound so it doesn't matter too much anyway. The English dubbing was good, and some of the accents are quite amusing. The English subtitles were also good and largely in time with the mouthing of the characters, but I noticed for the first time how many English words correspond with the Japanese word "Hai". Have a look for yourselves, there's a few more than you would think. Madman propaganda. -This propaganda is the best part of the extras containing, previews for the Last Exile, Final Fantasy Unlimited, Heat guy; project J and AbenoBashi. Apart from this, its a pretty lame set of extras.